E is for Explore! : DIY Shrinky Dinks! 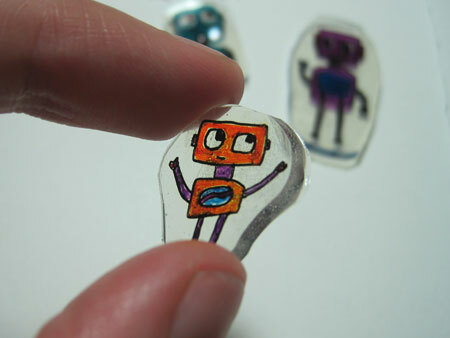 Check out these awesome shrinky dinks made by Futuristicky! Curbly instructs you on how to make your very own shrinky dinks with recycled plastic! Put them on a necklace, charm bracelet, or ring, whatever you please. You can also just play with them! When would you make the hole for a key chain link? Before baking or after? Erin. YOU...are my new hero. I can't even believe how awesome this blog is. I run a YMCA afterschool program and summer day camp, and thanks to you... my kids are going to think I'm the coolest director ever. My kids are going to LOVE these cool crafts...and you've SOLVED my science and math struggles! I'm always looking for FUN and easy ways to do science math and I'll never have that problem again!!! WOOOHOOOO! I am VERY grateful to have found this incredible little resource you've built and organized so nicely. You are a ROCKstar. THANK YOU THANK YOU THANK YOU!!! WOW, thanks for the great compliments! I'm glad you like the site!